Who are the rugby players in this picture? Can you name the players and location? The 77th HAA (Heavy Anti Aircraft) Regiment was created to provide air protection for Cardiff, Newport and Barry, and surrounding districts. Many of its members were local sportsmen who joined up together, such as Les Spence, who been Cardiff Rugby Club captain during the 1936-37 season, and his team-mate Wilf Wooller. Other sports stars in the 77th included Ernie Curtis who had been the youngest member of Cardiff City’s 1927 FA Cup winning side. 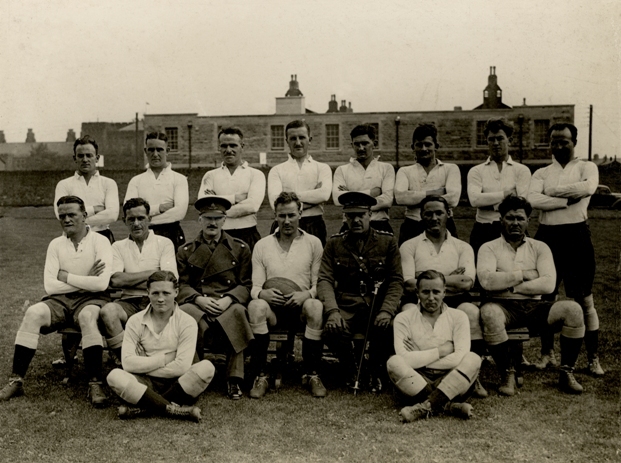 This photograph shows Les Spence (sitting, second from left) as he poses with other members of a rugby squad which is presumably related to his membership of the 77th. Wooller is sitting between the two uniformed officers. Standing third from the left is Ken Street who would be killed in a train crash in Java in February 1942. But where was the photo taken and who are the other players? * Throughout the horrors of prison camps in Java and Japan, Les Spence kept a secret diary. From his camp near the city ofNagasaki, he was able to record one of the most momentous moments in history: the dropping of the plutonium bomb on Nagasaki. Les – who was later to become president of the WRU – risked his life to write the diaries. They will be published next year. A new report into young people’s experience of custody paints a bleak picture of their hopes for going straight on their release. The report, published jointly by Nick Hardwick, Chief Inspector of Prisons, and the Youth Justice Board, sets out how young people aged 15 to 18 describe their own experience of imprisonment in 2010-11. When asked if they had done something during their time in custody that would make them less likely to offend in future, only half of them answered positively. This was despite high levels of them saying they wanted to stop offending: 92 per cent of young men and 93 per cent of young women. And although getting a job was cited by young men (and by 52 per cent of young women) as most likely to stop them offending, fewer than half of young people said they knew who to contact for help with finding employment. The report, ‘Children and Young People in Custody 2010-11: an analysis of the experiences of 15 to 18-year-olds in prison’, found that the number of children and young people held in young offender institutions continued to fall during 2010-11 from 1,977 to 1,822. However, more than half of the young men, 53 per cent, said it was their first time in custody, up from 39 per cent in 2009-10. The report also found that the proportion of black and minority ethnic young men in custody continued to rise; that over a quarter of young men and over half of young women said they had spent some time in local authority care; and that almost a quarter of young women and 13 per cent of young men had children of their own.